Teams of Greenpeace volunteers in seven major cities across the UK this morning have taken action to disrupt sales of some of the most gas guzzling 4x4s on sale at Land Rover dealerships. The activity is part of the UK's first national day of action against 4x4's. Small teams of Greenpeace volunteers entered Land Rover dealerships in London, Leeds, Bristol, Birmingham, Manchester, Glasgow and Southampton and handcuffed themselves to Range Rovers and Land Rover Discovery 4x4's. 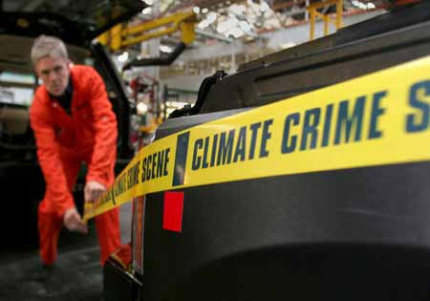 Wheel clamps have been put on some cars and the forecourts have been branded 'climate crime scenes' with climate crime scene tape surrounding the gas-guzzling 4x4's. Outside Greenpeace volunteers are toting placard boards with the message 'Land Rover - climate criminal'. The cars involved are some of the least fuel efficient available and activists hope to disrupt sales of them in a bid to stop them wrecking the climate. 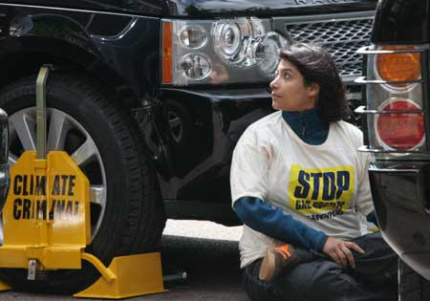 At a further 30 UK towns Greenpeace protests with volunteers outside Land Rover dealerships are being held. "We've taken direct action today across the country to stop Land Rover selling these climate wrecking cars. A petrol Range Rover Sport does a measly 12mpg in town, that's less miles per gallon than a model T Ford did 80 years ago. In a world where 150,000 people are dying each year because of climate change selling cars like this for urban use is indefensible." Land Rover is aggressively marketing these gas-guzzlers for use in cities. Once associated with hard-wearing vehicles for farming and other commercial uses Land Rover now markets their 4x4's or SUVs (Sports utility vehicles) as glamorous products for urban dwellers with £3.2million a year spent on advertising in London alone. Publicity material for the new Range Rover Sport boasts: "On-road it is astounding. There has never been a Land Rover so focused on precise handling, agility and awesome tarmac performance." The petrol Range Rover Sport is the least efficient of the top selling 4x4's in the UK, clocking in at only 12mpg for urban use. Other cars in the Land Rover range don't fare much better with some Discoveries only getting 12.3 miles per gallon. In stark contrast is the European car of the year, the Toyota Prius which does 55 miles to the gallon in the city - four times more than a V8 Range Rover Vogue or Sport. A recently conducted Greenpeace survey in the UK showed massive support for increased road tax on gas-guzzlers. Of those surveyed on average between 97 and 99% wanted higher taxes for cars that spew out high amounts of climate damaging Co2. The public of the UK are today being given the chance to show their rejection of gas-guzzlers as local volunteers distribute 100s of postcards calling on Land Rover to stop producing the climate wrecking cars, signed postcards will then be handed to local Land Rover managers at the end of the day. "Land Rover bosses are climate criminals, they continue to build and sell some of the most polluting and climate damaging cars around today. Land Rover and Ford have the know-how and expertise to develop far more fuel efficient vehicles but are choosing not to. Considering the climate crisis the world is entering that is nothing short of criminal. We're taking action across the UK to give them a message that they need to clean up their act." Today's events are part of a summer of action against gas-guzzling 4x4's involving a 1000 Greenpeace volunteers across the UK who will be using 20,000 road signs that say 'NO 4x4s', 50,000 cards to be filled in by the public and given to MP's, 25,000 4x4 'product recall notices' to be placed in car magazines, 1000 'incident boards' - notices that look like pleas for information at a crime scene and 50,000 car window stickers for use on urban 4x4s. In the UK transport accounts for about a quarter of all emissions that cause climate change, transport is also the fastest rising sector of UK Co2 emissions. Motor manufacturers such as Ford (Land Rovers parent company) could choose to play a leading role in the search for solutions to the current climate change crisis. In contrast Ford, both in UK and in the US, have actively tried to block efforts to tackle climate change. In the UK, Ford tried to block measures to introduce Co2 labeling on cars, similar to the energy efficiency ratings found on fridges (2) which could help the public choose lower emission cars. (2) The Independent 1 Feb 2004: Greenpeace is asking the prime minister to alter VED (vehicle excise duty) on cars to reflect their impact on the climate.